Famous drummer Chester Thompson performed with Concordia’s Jazz I this past Saturday. Photo by Bobby Person. Concordia played host to several world-renowned musicians this past Saturday for the 24th annual Day of Percussion, which brings professional percussionists to campus to provide clinics and perform with students. 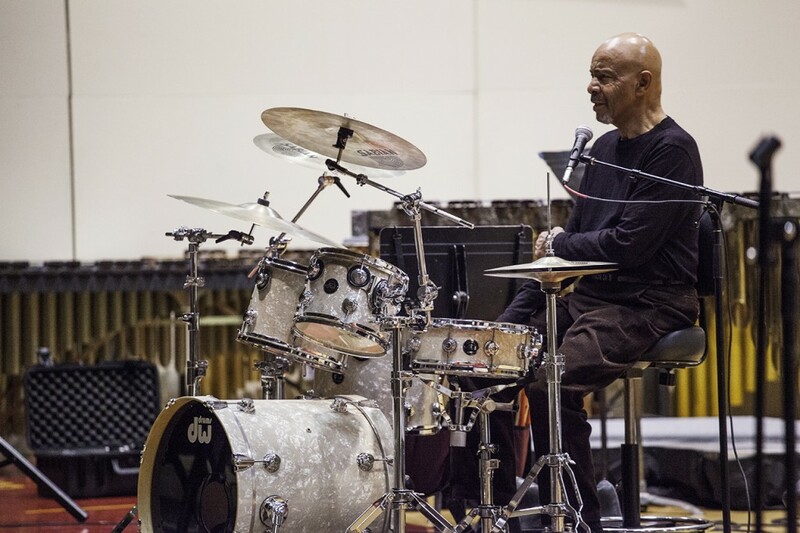 Among this year’s clinicians was Chester Thompson, best known for stints drumming with 1970s and 80s progressive rock group Genesis, along with Genesis leader Phil Collins’ solo tours. I attended Thompson’s afternoon performance with Concordia’s Jazz I ensemble along with the drumming clinic he gave afterward. I am a drummer myself, so I was not out of place in Saturday’s audience, which, by show of hands, comprised a vast majority of percussionists and drummers. I arrived to the event early, took my seat and stared at the plethora of instruments spread across the stage. I counted no less than 12 mallet instruments (xylophones, marimbas and the like) along with two drum sets and a large number of other instruments I was unfamiliar with. My companion for the performance was Spencer Nelson, a friend, fellow sophomore and a self-professed Genesis/Phil Collins fan. He told me before the performance started that he hoped to get a selfie with Thompson. percussion professor, stepped to the microphone. “Does anybody know any good jokes?” he asked, going on to explain they were awaiting the arrival of guest artist Thompson and Jazz I director Russ Peterson. Thompson and Peterson arrived before real worry had time to set in, and the concert began. The group opened with a brief drum solo from Thompson, which led them into a fast Latin groove. Jazz I’s regular drummers were reduced to playing auxiliary instruments,—a cowbell, congas and some kind of shaker—though I doubt they minded. The group’s second piece was a bluesy, mid-tempo swing tune, for which Jazz I’s regular drummers left the stage entirely. The other soloists on the group’s first two pieces were Jason Aylward on trumpet and Sarah Kremer on alto saxophone. Each had a distinctive style, with Aylward’s playing giving off a controlled but casual aura, with fewer notes but a lot of attention lavished on each one. Kremer’s style was more frenetic and seemed to come more from the gut, whereas Aylward’s came more from the head. The third and final piece of the performance saw Ryan Schlotterback, one of Jazz I’s drummers, return to the stage. This time Schlotterback sat behind the second drum set next to Thompson’s. The two drummers, along with piano professor Jay Hershberger, Jazz I bassist Dane Christiansen, and Jazz I guitarist Daniel Abel, gave a rendition of the Genesis song “The Cinema Show,” from the 1973 album Selling England by the Pound. Introducing the song, Peterson explained that it normally had two distinct sections. One section would be subdued and acoustic; the other louder and faster and instrumental. During the second section Thompson and Phil Collins used to play complex drum parts together. “We decided just to do the awesome instrumental section,” Peterson said. The performance that followed was imperfect but not obtrusively so. Schlotterback did briefly get a beat out of sync with the rest of the group, which made it feel as though the song were about to unravel, but he found his way back in after a few moments. Hershberger’s keyboard playing was wild, featuring extremely fast runs of notes and requiring him to cross one hand over the other to voice certain chords. However, the synth tone Hershberger used, though appropriate to the song at hand, was somewhat dated and grating. After the performance came Thompson’s clinic, about which I will not say too much, since it was concerned mostly with Thompson’s stick technique and the merits of learning to play with your non-dominant hand. Thompson started by telling a little about himself. He has spent much of the last few years teaching at Tennessee’s Belmont University, which he said was a position he did not expect to find himself in. Thompson began teaching at Belmont because his son was a student there, and the school was in need of a drum instructor. Initially Thompson had not planned to continue teaching after his son’s graduation, but he chose to stay because he does not want his progress with his students to go to waste.